CBD is getting a lot of attention these days, and for good reason! There are many different compounds in cannabis, perhaps more than one-hundred, but Cannabidiol (CBD), is arguably one of the most medically beneficial, and recently, one of the most widely talked about! In this first entry of the 2-part CBD Blog Series, we are going to dive into what makes CBD so unique from other Cannabis compounds. CBD Compounds: What Makes it Different? The cannabinoid Tetrahydrocannabinol, or THC, which is known for providing the notable “high” feeling that some may recognize after ingesting cannabis. Unlike THC, CBD has distinct analgesic (pain-reduction), anti-inflammatory, and anti-anxiety properties, without the psychoactive side-effect. Many inexperienced cannabis users will immediately associate ingesting cannabis with the quintessential “high” feeling that is often produced. This can be deterring for individuals looking to find relief from medical conditions while still being fully functional throughout the day. CBD interacts with our EndoCannabinoid System in a very specific way! Our EndoCannabinoid System controls various basic functions in your body in order to create a stable, level, internal environment. The Endo system consists of various, naturally occurring cannabinoids. Cannabinoids essentially allow communication and coordination between many aspects of your body and mind. CB1: CB1 receptors are mainly associated with the mind/brain, and play a role in sleep, appetite, emotion, mood, and memory. CB2: CB2 receptors are mainly associated with the body, and are found in the immune system, in glands, and in the gastrointestinal system. CB2 receptors are often associated with anti-inflammatory work. 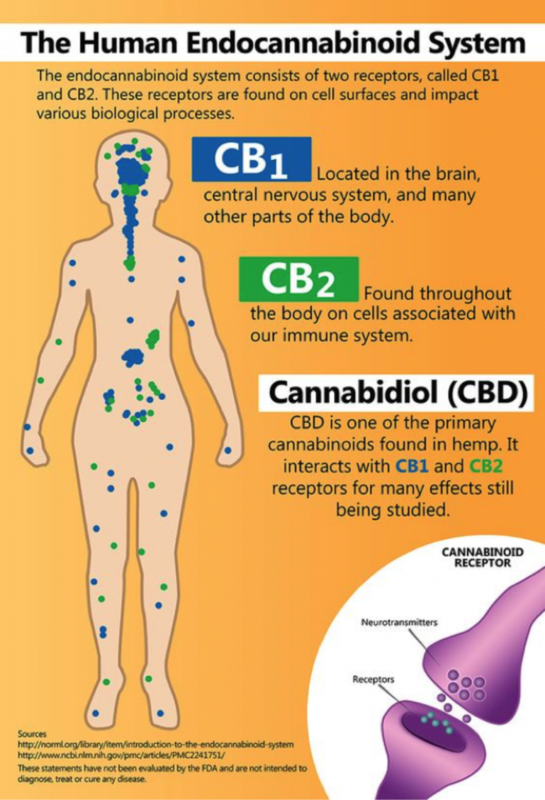 Effects of Cannabis on CB1 & CB2 Receptors: Your Body & CBD! While THC and CBD affect both CB1 and CB2 receptors, THC affects the CB1 receptor more notably, while CBD has a more distinct effect to the CB2 receptor. When a cannabis product containing THC is consumed and enters the body’s system, the most significant effects can be seen in the CB1 receptors. The compounds found in THC can put the receptor on “high alert” (pun intended). This reaction can induce feelings of creativity, focus, euphoria and pain relief. Many cannabis strains are high in THC, which is why many people associate consuming marijuana with feeling “high”. That being said, these receptors are activated in specific ways when introduced to cannabis cannabinoids like THC and CBD. Basically, the body’s own endocannabinoid system is structured in a way to naturally bind and interact with these potent cannabis cannabinoids, creating potentially medically beneficial effects! Why Aren’t More People Using CBD? Experienced cannabis users may be skeptical to try products high in CBD because they are accustomed to the “lifted” feeling associated with cannabis products high in THC, and don’t see the point of something that doesn’t produce this effect. While some swear by CBD as the miracle compound, the benefits associated with CBD are often enhanced when combined with small amounts of THC. Because of the immense amount of research being done on the CBD cannabinoid, recently, people looking for relief from serious medical conditions are seeking out CBD as an alternative to narcotic medications. In this case, patients are often not looking for the “lifted” feeling associated with THC, but rather, strictly the medicinal benefits of the plant. “It’s only been about five years since CBD re-emerged in the medical cannabis scene and was identified through Steephill Labs. The benefits of CBD-rich medicine, with its anti-spasmodic qualities, is one the most exciting and promising areas of cannabis medical research currently happening. Products high in CBD can now be found at most dispensaries, in a variety of forms. Popular flower strains include: Charlotte’s Web, Harlequin, Skunk Haze, Sour Tsunami, and Cannatonic. CBD oil is also widely vaporized in discreet “Vape Pens”, and can be infused into edible and topical forms, such as honey and balms. Because of the high anti-inflammatory properties found in CBD, it has been the subject of intense medical research regarding it’s medicinal and healing properties. CBD 102: A Medical Marvel?